Let Wild Willies enlighten you on the ins and outs of how to a trim a beard. Your mustache, if you have one, complements your beard and completes your look. You definitely need to invest time in trimming this essential facial hair feature. You’ll need a fine-toothed comb, a clipper or a razor, a mirror, and a pair of scissors. Get your fine-toothed comb and start combing your mustache hairs to straighten them. Take your clipper or scissors and start cutting away at the mustache hairs going past your upper lip. Cut so that you’re moving from the center of your mustache to the side. Next, you’ll want to use your scissors or clippers to remove renegade or wild hairs at the top of your mustache. Make sure you do it slowly so you don’t cut too much and affect the overall shape of your ‘stache. Use your fine-toothed comb and brush your mustache hairs upwards and away, and then keep the comb there. Let it work as a guard and use your scissors or clippers to trim away any hair peeking out of the comb’s teeth. You can also use your clippers equipped with a high guard setting to do this task. Apply a bead of your mustache wax on the middle of the facial hair. Avoid putting wax on the end of your mustache during this stage. This is for guys with handlebar mustaches or Imperial mustaches. Lift one end of the ‘stache and cut away any facial hairs in the corner of your lips if they’re not part of the beard style you’re going for. Apply a bead of your mustache wax on your fingertip and distribute it on your mustache. Use the comb to style it and remember to twirl the ends of the mustache or shape them according to the mustache style you want. You’ll need to add more volume before you can start trimming it down, or you might end up shearing off too much facial hair. You will need a beard brush, scissors, a razor, a mirror, and clippers with different guard settings. When your beard is ready, you’ll need to clean it first, so wash it with a beard wash.
Dry your beard because moisture will extend your beard hairs. You’ll definitely cut more than you bargained for if you do it while your beard is wet. Just follow the instructions in the first set of steps above and you’ll be fine. Take your razor and start defining the outer lines of the areas, like your sideburns or your goatee. Your beard neckline is an invisible line that starts from the top of your Adam’s apple and connects to the sides of your jaw. Use the neckline to guide you and cut or shave away any beard hair that exceeds the neckline for a tighter looking beard. Anything outside of the outlines you’ve set earlier with your razor should go. Now for the nice bonus, use your beard oil and give your beard a nice, brisk face massage to distribute the elixir. You’ll need a mirror, a pair of scissors, a blow dryer, clippers, a clipper guard with different settings, a razor, and a fine-toothed comb. Make sure you use beard wash to soften and condition your beard hairs. The water will straighten the kinks of your beard hair and extend them. If you cut your beard when it’s wet, you’ll cut away more than you want. Use a blow dryer if you’re in a hurry, but it’s best to air-dry your beard. Take your beard brush and brush in the direction of the beard hairs. You’ll need to straighten your beard hairs, remove frizz, and puff out the hairs. Use the clippers and go for the highest guard setting so you don’t trim too much of your beard. Trim the back portions first and then the front. If you’re trying to grow your beard, take out your scissors instead and cut away at the tips of the beard hairs. Take out any renegade hairs while you’re at it. Use your clippers and set the guard a notch down from the highest setting or two. Apply pressure gently while trimming your facial hair on your cheeks and your sideburns. Take note to copy the setting your barber uses when he works the sides of your face. Make sure the hairs on your cheek and your sideburns blend into each other well. This is what you call a fade. Talk to your barber and watch him do it if you can’t do it yourself. It takes a lot of practice to perfect this technique. Take out your razor and make sure you define the lines around your mustache, your sideburns, and around the facial hair you want to keep in your cheeks. Shave away any extra hair outside of these areas. Go for the scissors and make finishes on your beard. 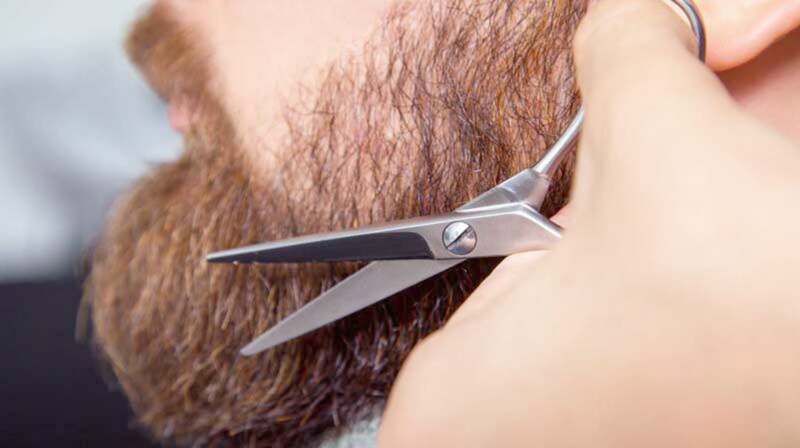 Remove any misbehaving hair and even out uneven beard hairs with your scissors. Remember to trim your mustache by following the instructions above. Finally, put a dash of beard oil on your beard brush, brush away any loose hairs, and give your bush a mighty pampering. Distribute the oil evenly with your beard brush. These steps on how to trim a beard serve as the foundation for beard grooming, more than buying beard care tools and products or applying the latest fad in beard styles. An unkempt beard is bad for business and boxes you into every negative stereotype people have of bearded men. Take care of your beard with these steps and your beard will highlight your best manly qualities instead of casting you in a bad light. What other beard grooming secrets do you want to know? Give us your answers in the comments section below. We’ll feature them in future articles. Love all the products! Especially the butter. Although the shampoo I’m kinda not sure about, I feel like it dries my beard out when I’m applying it. Do u have a 100% natural shampoo? Other than that couldn’t be happier! Thanks Adam! All our products are made with all natural and consciously sourced ingredients. After you wash with shampoo, we recommend following up with the beard softener to nourish it.